Bishoujo Senshi Sailor Moon Super S: Fuwa Fuwa Panic is a Sailor Moon themed competitive puzzle game. 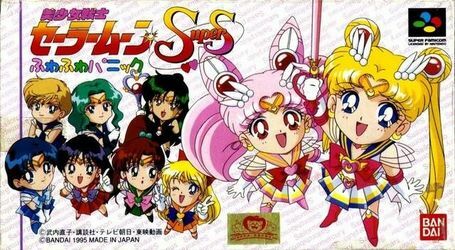 Players first select a character from among five Sailor Scouts and Chibiusa, each with a unique special move. They will then challenge each other in competition. Each player has a board which contains some balloons, in either red, yellow, green or blue. These balloons can be shot at in order to gain points and fill up the power bar. Balloons of the same color that are adjacent to one another with all be destroyed and generate more points. The goal is to avoid being the player whose balloons are pushed downwards off the board, and to make the opponent receive this fate. As groups of balloons are destroyed, they can reveal power-ups as well as produce black balloons on the opponent's board. Black balloons can only be destroyed by groups of colored balloons being removed adjacent to them. Players with a filled power bar can unleash special abilities.